It was the last week of May 2009 when Zach started having problems eating and sleeping. When his symptoms continued longer than the normal few days, Zach's parents, Jennifer and John, became very concerned. "This went on for a few days and then several people noticed his stomach was bulging out," said John. On June 1, 2009, Jennifer took Zach to the doctor where he underwent multiple x-rays and tests. The x-rays came back showing something extremely worrisome. There was a six-inch tumor on Zach's stomach that the doctor said had an 80% chance of being cancerous. After a surgery to inspect the tumor and a week of waiting, the diagnosis was confirmed: Zach had cancer. Zach was diagnosed with Stage IV, Group 4, Intermediate Risk Embryonal Rhabdomyosarcoma. The family immediately began connecting with oncology specialists at Cook Children’s Medical Center in Fort Worth, Texas. Zach was scheduled to undergo 45 weeks of chemotherapy and six weeks of radiation. 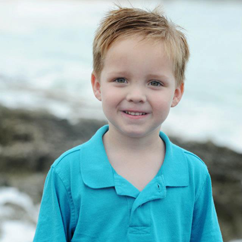 By March 2010, Zach completed radiation and the remaining tumor was biopsied. The doctors found active Rhabdomyosarcoma cells, so another surgery was scheduled to completely remove the remaining tumor. The operation was a success and the tumor was completely removed without damaging Zach's stomach or bladder. Zach's family was put in contact with The National Children's Cancer Society as soon as he was diagnosed. "The NCCS was so helpful with resources and travel funds when we needed them most," said John. "I also find the educational information very helpful. I read and listen to it all of the time."